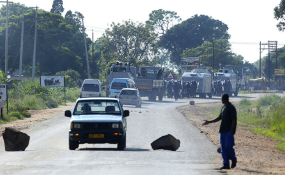 INFORMATION minister Monica Mutsvangwa minister said Tuesday that three people, including a police officer, died in the protests that started Monday. The minister described the violent protests as an act of terrorism. However, global rights group Amnesty International said at least eight people killed by the security forces and 200 arbitrarily detained. The organisation expressed alarm at the "repressive measures the government has taken in response to the protests, including shutting down the internet to prevent people from supporting or organising protests. "The police and military have also reportedly subjected people who were protesting to beatings and other forms of ill-treatment." Mutsvangwa told a press conference that the government was aware of the terrorism activities that were targeting police stations with the intentions of stealing weapons for criminal activities around the country. She added that the past two days have been characterized by well-coordinated criminal behaviour to destroy properties and unleash violence on innocent citizens. "Government urges members of the public to go about their normal day to day activities without fear as their security is guaranteed and we appeal to the public to remain calm and peaceful," she told the journalists. Meanwhile, ruling party Zanu PF spokesperson Simon Khaya Moyo blamed the opposition MDC Alliance for organising the illegal protests. "The current politically instigated, barbaric acts of terrorism being perpetrated by the MDC Alliance under the guise of mass protest should stop forthwith," Moyo said. On Tuesday Morning, central streets in Harare, the capital, remained empty as people stayed at home following Monday's violence. Internet access across the country was cut Tuesday morning. The Zimbabwe Congress of Trade Unions (ZCTU) and some civic leaders called for a three-day shutdown following the announcement of the fuel price increases on Saturday, arguing that ordinary people were being subjected to more suffering. Amnesty International's deputy director for southern Africa, Muleya Mwananyanda, said years of "political and economic mismanagement" had brought Zimbabwe's economy to its knees. "Millions of Zimbabweans are terrified about the knock-on effects that the fuel increases will have on their daily lives, including for food and healthcare," Mwananyanda added.